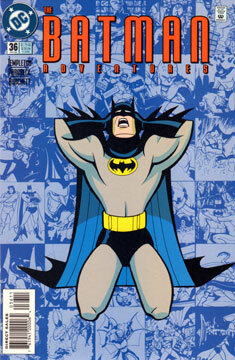 It’s the last issue of the original Batman Adventures! Robin leads batman out on patrol. With only the mind of a seven-year-old Bruce Wayne, Batman is more a liability than a help. They head over to Karl Rossum’s lab. Rossum has been dissecting the remnants of Hugo Strange’s memory machine to try and reverse engineer it. Rossum has learned that Hugo Strange had been contacted by Rupert Thorne’s men to build a “blackmail” machine. He refused. In retaliation, Thorne had Strange’s son murdered. In order to free himself of the painful memory, Strange built a memory-extraction device. He succeeded, but he couldn’t remember that he succeeded, so he kept subjecting himself to the machine. At that point he was mad, and decided he would erase his entire memory, storing it on a large diamond. That’s when Batman had arrived, and become the inadvertent target. Thus his memory was stored on a large diamond somewhere. Batman recalls Catwoman had such a jewel, and rushes to find her. Meanwhile, Strange’s mind continues to crack, and he decides to confront Thorne. Batman finds Catwoman, and she agrees to turn over the diamond if he agrees to look the other way where she is concerned in the future. He reluctantly agrees. He takes the diamond to Rossum, and together Batman reclaims his memories. In command of his faculties again, Batman realizes Strange may go after Thorne. He’s right, as Strange meets with Thorne at Thorne’s home. Strange manages to kill a guard before he can get to Thorne. Thorne’s men are about to take down Strange when the Dynamic Duo arrive. Batman promises Strange he will get help. Finally, Catwoman delivers the jewel he stole, so he can return it to the museum. She is thrilled to learn he has no memory of the promise he made to her. And that’s the end! I wish I could say I like it better. Again, the whole thing hinges on Strange, and his actions are out of character. He denies a job working for Rupert Thorne? That’s right down his alley! He loves his son so much he can’t forget him? He loves at all? That doesn’t sit right with me. I think there are some fun narrative threads in this, but they were somehow mishandled. But it’s far from the worst of the animated comics. I have to give it credit for that. Overall, it was a dammed good run. Thanks, guys!